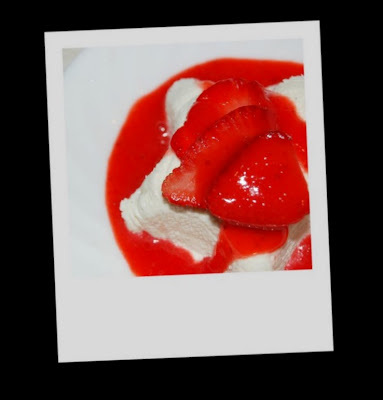 This week's Barefoot Bloggers recipe - Coeur a la Creme- was chosen by Becke. I've wanted to try it since I first got Barefoot in Paris so I went ahead and ordered the heart dish from Amazon. However, I was trying to be practical and not fall into the must-spend-25-bucks-for-free-shipping trap, so I bundled my order with my cousin who was preordering a book coming out next month. In the past, I've preordered and my package has come in two shipments, even with free supersaver shipping. However, Amazon shipping must not have been feeling as generous this time so my dish did not arrive before the deadline. So, I used my trusty old collander as a mold instead of the pretty heart she recommends (simply line the dish with cheesecloth, which I found in the baking aisle of my grocery store, and place it over another dish so it can drain- so fancy equipment needed!) I also saved the vanilla bean and tossed it in a jar with some sugar to make some vanilla sugar for my hubby. Yummy. In addition to the round form, I thought I would try making some star shape molds out of some Reynolds Star Foil Cups someone gave me. There was plenty of cream and the star molds really only needed a few tablespoons each. I poked holes with an ice pick and propped them up on top of some plastic knives so they would still drain off. They turned out adorable and were a cheap alternative to my beautiful heart dish that is yet to arrive (but will surely be used the very same day, I'm so anxious now!) The best way I can describe this dessert is like delicious vanilla bean ice cream- but better. The vanilla flavor is strong and lovely and the strawberry sauce is the perfect compliment. Although the ingredients are similar to a no-bake cheesecake, I didn't feel like it was as heavy which was perfect for a hot summer night. Naturally, I modified the recipe by serving it with strawberries and strawberry coulis instead of raspberries. Either would be a great addition so use whatever looks delicious. I do have one word of caution- I never buy regular cream cheese and instead get the reduced fat Neufchatel cheese. I did remember to buy the good stuff this time but only got one package (you need one and a half) so I substituted Neufchatel for 4 ounces. I think this caused my dessert not to set up quite as well as it would have, even though I left it in the fridge for over 24 hours. Also, thanks to some lovely comments, I was able to find vanilla beans for a great price online at the Organic Vanilla Bean Company. So now that I have a good stock of vanilla, a beautiful dish on it's way, and plenty of cheesecloth, you can bet I'll be making this again. Another beautiful, delicious dish from Ina! Place the cream cheese and confectioners' sugar in the bowl of an electric mixer fitted with the paddle attachment and beat on high speed for 2 minutes. Scrape down the beater and bowl with a rubber spatula and change the beater for the whisk attachment. With the mixer on low speed, add the heavy cream, vanilla, lemon zest, and vanilla bean seeds and beat on high speed until the mixture is very thick, like whipped cream. Line a 7-inch sieve with cheesecloth or paper towels so the ends drape over the sides and suspend it over a bowl, making sure that there is space between the bottom of the sieve and the bottom of the bowl for the liquid to drain. Pour the cream mixture into the cheesecloth, fold the ends over the top, and refrigerate overnight. To serve, discard the liquid, unmold the cream onto a plate, and drizzle Strawberry coulis around the base. Serve with sliced strawberries and extra sauce. Wash and trim strawberries. Place them in the blender with the sugar. Add just enough liquid to blend strawberries until smooth. Pour liquid through a sieve to remove seeds and chill until ready to serve. Lately, it seems I have been baking with fruit more than I ever have before. Before this summer, the only fruity desserts I really made were with apples or peaches (living in Utah will do that to you... I miss the fruit like crazy!) However, I liked the Blueberry Pie so much that when I found blueberries on sale, I made another pie to put in the freezer. I saved half of the pie dough in preparation for this dessert so it really came together quickly which was perfect. Although I will be the first to admit I've been aching to bake some beautiful, fancy chocolate creation, this fruit was just so pretty that I had a great time on this week's recipe, from start to tasty finish. I'm also a little more keen on fruit desserts and love feeling a little more confident in the pastry world. I found some beautiful nectarines, plums, and blackberries at Trader Joe's. Just a quick wash and dry, then slicing into quarters, was all the fruit needed. I love simple things like that. They were also so pretty that my son kept trying to grab them off the counter to snitch while I was trying to photograph them! To make the galette, roll out the pie dough and spread some jam in a circle on the bottom. I used strawberry blueberry freezer jam because, as my husband keeps informing me, we are woefully short on jam at our house (which means, if the Smucker's Raspberry Preserves are all gone, there's not really a point to getting up in the morning.) I couldn't really taste it at the end, though, so I suppose a particular jam-flavored deficiency isn't the end of the world. Then I topped the jam with some crushed graham crackers to help absord the fruit juice. Put the fruit, cut side down, on top and cram in as much as you can- it will shrink down when baked. Gather up the edges and fold them over to enclose the fruit. Bake on a silicone sheet lined pan. After the initial bake time, I was seriously tempted to just break out some forks and enjoy this beauty. Without any topping, it still looked juicy, bright, and delicious. She's finally done! I absolutely love this crust recipe and thought it was just the right color and texture. Can you see all the dark, juicy goo coming out of my galette? Even with double the graham cracker crumbs there was a little mess. Next time I'll use a bit more crumbs so that it looks a little nicer! Go ahead, dive in. This isn't a fancy pants dessert- it's a tell-the-photographer-to-hurry up-already and lick-your-fingers kind of dessert. Perfect. This week's Tuesdays with Dorie choice comes from Michelle and you can find the recipe on her blog. My husband and I have had the same problem since we've met. He likes Chinese and I like Italian. I know, that's a big problem (almost as big of problem as both being Virgos, which apparently is pretty serious and I was told we should have broken it off straight away because of that! Fortunately, we're five years strong despite our close birthdays!) Anyways, I can't get enough Italian and when he sees me boil a big pot of water he rolls his eyes and dreads the inevitable sound of the pasta shaking out of the box. So last week, I decided that we would compromise- Chinese on Thursday and Italian on Friday. The flavors of this salad are wonderful- spicy, sweet, crunchy. I love how the dressing mixes with the sauce from the chicken to make such a delicious dressing. This salad comes together in a flash thanks to the store bought chicken. I know, half of the people who read this blog roll their eyes at the chicken from the freezer case, and the other half says, "Finally something simple I will make!" I don't normally reach for premade foods but I don't have a deep fryer and the whole idea is to have the Pei Wei salad in less time than it takes to go to Pei Wei! So, stop by the freezer case next time you are at Costco and pick up some Orange Chicken. When your Chinese-Loving Husband comes home STARVING from work, you'll be glad you did (even if it's not Italian)! Add if he's really starving, cook up some brown rice to go on the side. Yum. Line a baking sheet with a Silpat or foil and bake the chicken until the internal temperature reads 165, rotating half way through. Meanwhile, in a large microwave safe bowl, pour in the Orange sauce and warm through in the microwave. After the chicken is cooked, toss in the dressing bowl and set aside. Assemble the vegetables in a large bowl and toss. Prepare dressing. Serve salad topped with dressing and spicy chicken. For more heat, add a little Sriracha Chili Sauce to the chicken. Pour the lime juice into a small, screw-top jar. Add triple the amount of extra virgin olive oil. Add the Sugar, Salt and pepper to taste, and shake to combine. I use a little tiny jar and it turns out to be about 1 Tablespoon of juice and 3 Tablespoons of oil. Just be sure to get a good ratio, so the dressing isn't too tart. Pour over salad, toss to combine. Seriously though, why is it that things turn up when you don't need them anymore? At least if the urge to make another fruit dessert hits in the next little while I'll have a source. Speaking of sources, does anyone know a good place to buy vanilla beans- online, in stores, whatever? I'm working on next week's Barefoot Bloggers Recipe and wasn't thrilled with the price at Safeway. Insider tips would be appreciated! This week's Barefoot Bloggers dish was chosen by Ashley and I'll be the first to admit I wasn't too pumped about fish dip. However, one of the reasons I joined Barefoot Bloggers was to expand my repertoire. So I made it anyways and it was a success! I took it to a play-date and everyone enjoyed it (except me, since I thought it was a little fishy- but I only had canned salmon available and I'm sure that was the problem). However, before I added the fish I thought it was amazing, particularly the fresh dill. I also love the fact that there is no mayonnaise in this recipe (I have a psychotic aversion to mayonnaise that I can't break, just ask my husband). I'd been meaning to try this dish for a while and Bastille Day was the perfect excuse. It was pretty simple to make ahead which is a big plus in my book. First, blanch the garlic for a minute or two so they're much easier to peel. Then, brown the chicken- make sure to get it nice and brown, this is all the color you're going to get! Then I made the sauce (all in my roasting pan), put them together, and stowed it in the fridge until just before dinner. Just before diner, I put it in the oven at 400 for about 30 minutes (I set my thermometer to beep at 165 so I know when it's done!). I used white grape juice instead of the alcohol (I know, it cooks out, but we don't have any and I was serving this to a pregnant woman anyways!) and it tasted amazing- especially considering I don't really even like grape juice. I think the fresh thyme really made the dish- I think my little windowsill herb garden has more than paid for itself. Serve with potatoes, rice, or your carbohydrate of choice. :) The gravy is delicious (even though I accidentally forgot to include the cream) and tastes great served over rice with the left over chopped chicken for the next day. Two for one, that's what I'm all about. Separate the cloves of garlic and drop them into a pot of boiling water for 60 seconds. Drain the garlic and peel. Set aside. Dry the chicken with paper towels. Season liberally with salt and pepper on both sides. Heat the butter and oil in a large pot or Dutch oven over medium-high heat. In batches, saute the chicken in the fat, skin side down first, until nicely browned, about 3 to 5 minutes on each side. Turn with tongs or a spatula; you don't want to pierce the skin with a fork. If the fat is burning, turn the heat down to medium. When a batch is done, transfer it to a plate and continue to saute all the chicken in batches. Remove the last chicken to the plate and add all of the garlic to the pot. Lower the heat and saute for 5 to 10 minutes, turning often, until evenly browned. Add 2 tablespoons of the Cognac and the wine, return to a boil, and scrape the brown bits from the bottom of the pan. Return the chicken to the pot with the juices and sprinkle with the thyme leaves. Cover and simmer over the lowest heat for about 30 minutes, until all the chicken is done. Remove the chicken to a platter and cover with aluminum foil to keep warm. In a small bowl, whisk together 1/2 cup of the sauce and the flour and then whisk it back into the sauce in the pot. Raise the heat, add the remaining tablespoon of Cognac and the cream, and boil for 3 minutes. Add salt and pepper, to taste; it should be very flavorful because chicken tends to be bland. Pour the sauce and the garlic over the chicken and serve hot. 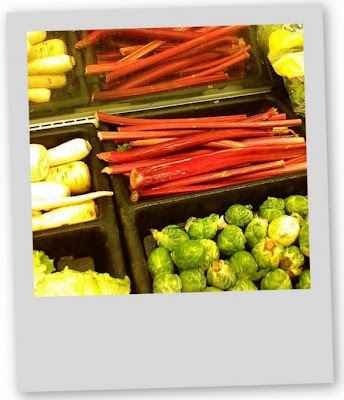 This weeks Tuesdays with Dorie recipe was chosen by Amanda. She chose Cherry Rhubarb cobbler and I immediately went hunting for rhubarb. After trying every place I could think of (Safeway, Fry's, Trader Joe's Sprouts, Costco) I decided this cobbler was going to be a peach cobbler or nothing at all, so I opted for peach blackberry (with Cinnamon instead of Ginger). Once the pan came out of the oven, I wasn't overwhelmed by the beauty of the dish. However, after I scooped out a serving, I was happily surprised by the color contrast of the fruit. All the juice at the bottom turned bright purple (that color is not at all touched up) and I loved the layered look. I also thought this cobbler was delicious with a little vanilla ice cream and enjoyed every bite of it. The recipe is available on Amanda's blog or in Baking by Dorie Greenspan. Last Monday we celebrated Bastille Day (kind of the French 4th of July). I invited my cousin over who lived in Paris for a couple years and we had a nice time eating French food, drinking Orangina, and wrestling our children (her daughter is the adorable little girl with the blueberry tongue). We had a great time and loved all the delicious French food. I love Barefoot in Paris and crack up every time I read the dedication- "For Jeffrey, who makes Paris so delicious". She's so cute. I used the Lemon meringue tart filling from Ina's book but used Dorie's Sweet Tart Crust since it's so easy and delicious (plus, with that menu and a full day I didn't to risk trying something new!). I loved the taste of this tart but I was a little disappointed with the look of the meringue. It was so beautiful in Ina's book! I think part of the problem is the enormity of my tart pan- 11 instead of 9 inches! It takes one and a half crust recipes to fill and it made the loops of piped meringue look a little stretchy instead of perfect. Oh well, it was delicious! Put the flour, sugar, and salt in a food processor and pulse a couple of times to combine. Scatter the pieces of butter over the dry ingredients and pulse until the butter is coarsely cut in- you should have some pieces the size of oatmeal fakes and others the size of peas. Stir the yolk, just to break it up, and add it a little at a time, pulsing after each addition. When the egg is in, process in long pulses- about 10 seconds each- until the dough, which will look granular soon after the egg is added, forms clumps and curds. Just before you reach this stage, the sound of the machine working the dough will change- heads up. Turn the dough out onto a work surface and, very lightly and sparingly, knead the dough just to incorporate and dry ingredients that might have escaped mixing. Cream the butter and sugar in the bowl of an electric mixer fitted with the paddle attachment for 1 minute. On low speed, add the eggs and egg yolks one at a time, and then add the lemon zest, lemon juice, and salt. Don't worry; it will look curdled. Pour the mixture into a small saucepan and cook over medium-low heat for 8 to 10 minutes, until thick, stirring constantly with a wooden spoon. Whisk briskly when it starts to thicken and cook over low heat for 1 to 2 minutes, whisking constantly. Don't allow it to boil! It will be 175 degrees F on an instant-read thermometer. Pour into a bowl and cool to room temperature. For the meringue, whip the egg whites, cream of tartar, and 1/4 teaspoon salt in the bowl of an electric mixer fitted with the whisk attachment on high speed until frothy. With the mixer still running, slowly add the remaining 1/2 cup of sugar and beat until the meringue is thick and shiny, about 2 minutes. Immediately spread the lemon filling in the cooled tart shell and pipe the meringue over it with a large star tip. Be sure the meringue covers the entire top and touches the edges of the shell, to prevent it from shrinking. Bake for 3 to 5 minutes, until the meringue is lightly browned. Cool to room temperature. I told my husband that my friend Pamela had tagged me for a Meme and I asked him what six random things my "readers" needed to know. (I of course meant this sincerely and didn't know what to do because my "real life" people and my foodie friends both read this blog, so it's kind of a diverse audience!) Here are the first couple that came to his mind: "How about that you are six feet tall, you have a Schoodle for a dog, you like to cook, if you could be any animal you would be a strawberry, and you have an incredibly hot husband." Well there you go. In case that's not enough (and those things are all true except the being a Strawberry animal) here are six more. 1. I really admire Julia Child. I started taking French in ninth grade and had the best teacher of my life. He was a retired French military man and taught with discipline and precision. I learned so much and enjoyed his class so much that he inspired a love of language and culture I never thought I would find when I signed up for French 1 in junior high. I traveled to Paris for a summer session abroad after my first year of college and loved every minute, although I was love sick for my aforementioned hot boyfriend who I married later that year. 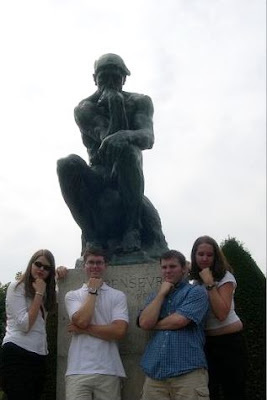 (That's me on the left at Rodin's house in front of Le Penseur. I miss my long hair. ), I have dreams of going to Paris together someday, and we just might when we go to Greece this fall to pick up my brother John who has been serving a mission there for our Church. A wonderful European vacation with my family is a big dream of mine. 3. I really (almost freakishly for a girl) like cars. I know that isn't something I would bring up immediately about myself, but it is a random thing about me and pretty big part of our family since my Dad works in the car business and even met my mom while he was working at a car dealer. 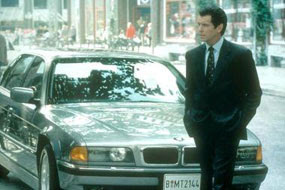 I've always had a fondness for BMWs and Pierce Brosnan sealed the deal for me with his 750 in Tomorrow Never Dies (though I wasn't crazy about the movie, I loved the car!). My Dad actually works at BMW now and I love it. 4. I'm seriously afraid I'll never have a daughter. My husband is from a family of all boys and I always worry that I'll end up with six tall, hungry boys and no girl, though at least we'll have the common ground of a love of fine automobiles, right?! I love my son more than I can say. But I want a girl too! For a long time I've wanted to name my hoped-for daughter Paris, but due to celebrity shenanigans, my husband has strongly vetoed that. For now, in my imagination, her name is Kate. 5. My favorite color is RED. Anyone who reads this blog regularly has probably seen gratuitous pictures of a certain red cake platter and KitchenAid, but I can't help it. I used to love blue and red was always my brother's favorite color (it was good for labeling, having each kid a different color you know) but when I was in High School I was surfing an awesome new website one day, GAP.com, and saw a red patent leather purse on sale. I bought it, then a pair of red shoes, and the rest is history. I suspect red will be my favorite color for the rest of my life. 6. I'm ridiculously afraid of creepy things- bats, snakes, lizards, most birds, bugs, etc. For the most part, I like to think of myself as confident and strong, though that's clearly not the whole story. My husband teases me about being afraid of such little things, but he's good enough not to really torment me since he knows I'm so sensitive about it. That being said, once, in my cooking class in college, I cut up a whole chicken while the rest of my group sat at watched. After I finished, one girl said, "Thanks for doing that. I was really afraid to touch it when it was, you know, a whole chicken. That was pretty sweet." I had to laugh, since I might be big and strong about some things, but I am certainly super squeamish about anything slightly creepy. Cutting up a chicken, though, is no problem, though touching a live chicken would be way too much for me. I guess my brood of boys will cure that! So, that's me. Hopefully you had a little laugh about some girl being afraid of birds and loving her Red KitchenAid. I'm not going go tag anyone specifically, but I'd love to read your Meme if you want to share! Leave me a comment if you do. When I told a few people this week's "Dorie Treat" was chocolate pudding, they kind of looked at me with a blank stare, and I knew they were thinking, "Shouldn't it be some fancy French tart or elaborate cake or something?" Well, I'll admit I kind of thought that, too, but once I read Dorie's description on her blog and in the book I realized there is a little more to pudding. Then, after I went the week without sugar or any artificial sweeteners as a sort of dare, I was ready for pudding. Also, I had a few days without my wonderful camera and I was missing it like crazy too! Pardon the pictures, but the pudding tasted great anyways. It was rich and so chocolaty. I needed lots of whipped cream to balance the deep chocolate, but I know lots of chocolate lovers who would have loved it straight from the cup. I might try making it swirled with vanilla next time... a little less rich but enough chocolate that you can still appreciate the amazing taste. "for many of us, I'm sure - the sweetness of pudding begins even before the first spoonful because there's something serene, sensuous and satisfying in the act of just making pudding." Now I know, after reading that, you are visualizing what kind of chocolate you have in your pantry. So go make it! You can find the recipe on Dorie's wonderful blog or at It's Melissa's Kitchen. Thanks for a great choice Melissa! I'll never look at boxed pudding the same again! Orange Berry Muffins by Dorie and an Award! Back in January, I saw a few food bloggers had all made the same muffin and the recipe looked great, so I made my first Dorie recipe- Orange Berry Muffins. I didn't even know about Tuesdays with Dorie then, but I enjoyed making the recipe and while they were tasty, they didn't quite turn out right. So, yesterday, I thought I'd make something yummy for breakfast and when I saw the blueberries in the fridge looking perfect I knew just the thing. This time, the muffins were delicious- pleasantly plumped, fragrant, and flavorful. Serve with honey butter or jam and enjoy. I also have a blog award from cute Mary Ann from Meet me in the Kitchen. She's so sweet and makes wonderful, homey food. Thanks Mary Ann! Now I'm supposed to pass it on, so here are a few favs that I'll pass this award onto. Check them out! Keep up the great cooking everyone- and go make your honey some muffins for breakfast! Getting Ready: Center a rack in the oven and preheat the oven to 400 degrees F. Butter or spray the 12 molds of a regular-size muffin pan or fit the molds with paper muffin cups. Alternatively, use a silicone muffin pan, which needs neither greasing nor paper cups. Place the muffin pan on a baking sheet. In a large bowl, rub the sugar and orange zest together with your fingertips until the sugar is moist and the fragrance of orange is strong. Whisk in the flour, baking powder, baking soda and salt. Pour the liquid ingredients over the dry ingredients and, with the whisk or a rubber spatula, gently but quickly stir to blend. Don’t worry about being thorough–the batter will be lumpy and bubbly, and that’s just the way it should be. Stir in the blueberries. Divide the batter evenly among the muffin cups. Bake for 22 to 25 minutes. If you want to top the muffins with decorating sugar, sprinkle on the sugar after the muffins have baked for 10 minutes. (But be smarter about it than I was, and don't sprinkle it while the pan in still in the oven so you get sugar burning all over!) When fully bakes, the tops of the muffins will be golden and springy to the touch and a thin knife inserted into the center of the muffins will come out clean. Transfer the pan to a rack and cool for 5 minutes before carefully removing each muffin from its mold. This salad is a perfect summer lunch- light, flavorful, and easy to put together. I've used the same recipe for poppy seed dressing for a while but always thought it was a little too sharp. I got this recipe from my Aunt Diane who always makes the best salads- and sure enough, it's the perfect balance of sweet and tangy. Add whatever berries you have on hand- we used strawberries, blueberries, and blackberries. Toss with a little spinach, some Havarti or Monterrey Jack cheese, and some chicken if you want to make it a meal. Candy your pecans with a little cinnamon for some extra flavor and enjoy! Put all ingredients except the oil in a food processor or blender. Blend until smooth and then, with the machine running, slowly drizzle in the oil to emulsify the dressing. Pulse once more and store the dressing in the refrigerator. Keeps two weeks in a sealed container. Add dressing immediately before serving to a bed on spinach or spring mix with assorted berries, cinnamon sugar candied pecans, and Havarti or Monterrey Jack cheese. Add sliced chicken breasts if desired. This weeks Barefoot Bloggers recipe was chosen by Sabrina and Alexander from Cooking with the Kids (actual foodie kids, it's awesome!). I've made this recipe before so I went ahead with the same modifications as last time- less butter (3/4 what Ina calls for), a bit more milk to compensate, more onion, more jalapeno, and some fresh cracked pepper on top. I love the texture of this cornbread but wanted a little more flavor and I loved how they turned out- just a little spicy and the perfect accompaniment to a bowl of chili. Chili really wasn't on the menu, though (since its 115 degrees or something) so we just enjoyed this warm out of the pan. I'll definitely revisit this recipe once fall comes, though. Another winner from Ina! You can see the rest of the Barefoot Bloggers sites here, check it out! Combine the flour, cornmeal, sugar, baking powder, and salt in a large bowl. In a separate bowl, combine the milk, eggs, and butter. With a wooden spoon, stir the wet ingredients into the dry until most of the lumps are dissolved. Don't overmix! Mix in 2 cups of the grated Cheddar, the scallions and jalapenos, and allow the mixture to sit at room temperature for 20 minutes. Meanwhile, preheat the oven to 350 degrees F. Grease a 9 by 13 by 2-inch baking pan. (I used an 8 x 8 pan for a half batch and baked about 30 minutes). I love that when I look at this picture I feel COLD! The touch of orange is almost undetectable but provides a depth of flavor that doesn't not go unnoticed. These delicious, chocolate covered brownie bites are simple, beautiful, and elegant. Even without perfectly swirled tops, I just want to dive right in! And as you can see from the next photo... my camera has been diving into the food a bit too much lately! What IS that spot on the photo?! Flour, butter, chocolate, dust? Who knows! Getting Ready: Center a rack in the oven and preheat the oven to 350 degrees F. Lightly butter two miniature muffin pans, each with a dozen cups, and place them on a baking sheet. If you're using the orange zest, combine the zest and sugar in a small bowl, rubbing them between your fingertips to blend: set aside. Whisk together the flour and salt. Melt the butter, chocolate, and brown sugar in a medium heavy-bottomed saucepan over very low heat, stirring frequently with a heatproof spatula and keeping an eye on the pan so that nothing overheats or burns. When the mixture is smooth, remove from the heat and cool for a minute or two. Stir the vanilla, egg and the zest into the chocolate mixture. When the mixture is well blended, add the flour and stir only until it is incorporated. You should have a smooth, glossy batter. Spoon the batter into 16 of the muffin cups, using about a teaspoon of batter to fill each cup 3/4 full. Put 1 teaspoon of water in each empty cup. Bake for 14-16 minutes, or until the tops of the buttons spring back when touched. Transfer the pans to racks to cool for 3 minutes before carefully releasing the buttons. Cool to room temperature on the racks. To make the glaze: Melt the chocolate over a double boiler. Stir constantly and don't leave the chocolate for even one minute- white chocolate scorches easily. As soon as the chocolate is smooth, remove from the heat. One by one, dip the tops of the buttons into the chocolate, twirling the buttons so that you get a little swirl at the center of each one and the excess chocolate drips back into the bowl. Refrigerate the buttons for 15 minutes to set the glaze. Storing: Covered, these will keep at room temperature overnight. If you wrap them air tight, you can freeze them for up to 2 months.